Cory Schneider must have been relieved when the Canucks squeaked out a win during a shootout with the Calgary Flames last night, but the player who stole the spotlight was Zack Kassian. 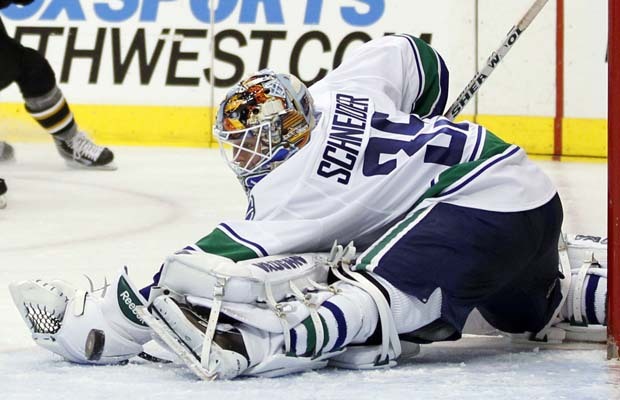 He scored one of two goals during regulation time, and then scored the winning shootout goal that gave the Canucks their first nail-biting 3-2 win of this shortened season. 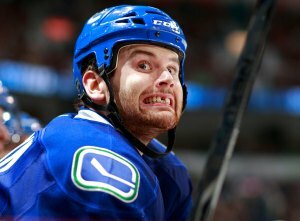 By the end of the game Kassian was undeniably the stud of Rogers Arena. I’m almost certain he and Pamela Anderson, who attended the game, hooked up for some late night cuddling. 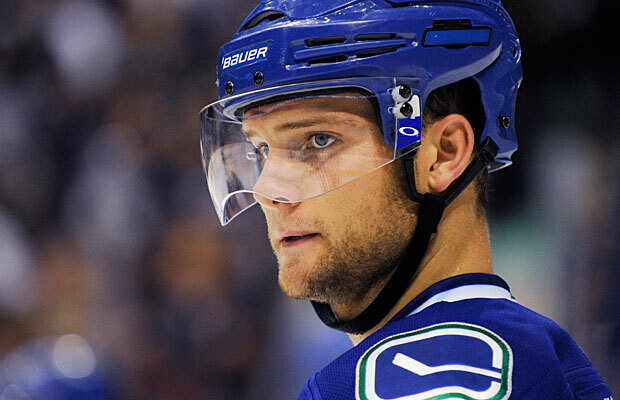 Nearly a year ago, I was one of those who lamented the loss of Cody Hodgson in a trade that included Kassian. And it wasn’t just because Cody is as cute as a button. He’s also a talented, refined hockey player who was developing a beautiful chemistry with the Sedins that was beginning to produce results. Other Canucks fans felt the same, and still do as we watch Cody making an impressive start to his season with the Buffalo Sabres who have so far won both of their first two games. However, I do have to mention that Cody looked much better wearing the blue and green than he does in the pukey dark blue and urine colors of the Sabres. Blech. But I digress! As Kassian’s star began to rise last night with the first goal, and then the winning shootout goal, the cocky chorus of “Cody who?” and “Where are all those Cody lovers now?” grew even louder in the Twitterverse. Here come all the tweets from the people who were pissed off when we traded Hodgson. Now all of a sudden they are number 1 fans of Kassian. Yes, go ahead, crow and thump your chest over Kassian’s achievements for the past two games, but, let’s keep things in perspective: the Canucks were playing the Flames, a team they normally have no problem beating, plus they blew a 2 point lead again, sending the game into a double shootout. By the end of the first shootout, I was literally curled into a fetal position on the couch clutching a bottle of cabernet while watching with one eye open. It wasn’t pretty! However, I will admit that I’m begrudgingly beginning to see sparks of talent from Kassian who trained with the Sedins for a few weeks during the off-season, as reported by Jason Botchford of The Province. This partnership with the Sedins appears to be an inspired match so far. Kassian has fists of steel that makes him an imposing protector, but he also has nerves of steel that enable him to perform well in a high-pressure shootout. In fact, I just dropped Cam Fowler to add Zack Kassian to my Fantasy Hockey League team, Surrender Dorothy, because not only can Zack drop a house on his opponents (see Ben Eager), he’s proving that he can play well with the cerebral Sedin twins to produce that which has been agonizingly scarce for the Canucks ever since Cody’s departure: GOALS. Only time will tell if this is just a fluke or the beginning of a beautiful romance. But in Vancouver, we know how fickle these hockey romances can be. Just ask Roberto Luongo and Cory Schneider. It takes just one or two bad games for the Bedazzled sequins to tarnish and lose their sparkle. But I’d be willing to bet that after Kassian’s performance in the past two games, David Booth is quivering in his bear-skin moccasins right about now. This entry was posted in Vancouver Canucks and tagged Buffalo Sabres, Calgary Flames, Cody Hodgson, Cory Schneider, Daniel Sedin, David Booth, Henrik Sedin, Pamela Anderson, Roberto Luongo, Vancouver Canucks, Zack Kassian. Bookmark the permalink. I like both players, but Hodgson did something Kassian has not done. Prodouce points and offence without the Sedins feeding him the puck….. When Zack can creat offence on another line I will be on the Kassian bandwagon. Cody played the softest minutes in the league and actually had better chemistry with Dan Hamhuis than anyone I’ve seen. Also Cody isn’t playing with scrubs, Tomas Vanek is fireworks right now. This is terrible. “Beginning to see sparks of talent”? Kassian has boatloads of talent, and hands as soft as baby wipes. His passing was sublime the past two outings. Granted, it’s only 4 games in and a man of his age is bound to have struggles with consistency and confidence along the way, but there’s a good reason Gillis was willing to trade a bonagide blue chip prospect for Kassian – he’s the goods. Hodgson did not create any chemistry with the sedins, hes a center and so is one of the sedins.. I don’t think you even know what you are talking about, probably just likes to listen to his own words. Yes Hodgson did play with the Sedins, it was during a power play.